Bertha Solis' baby boy, Leonardo Veliz Jr., was the first baby born at our newly renovated birthing center. The hospital administration and medical teams at The Birthing Center welcome you to the newly renovated facility. In the wake of recognition for excellence in quality by Healthgrades™ at both Edinburg and McAllen, the addition of new OB/GYNs to the Edinburg campus, the reputation of great patient experiences and strong market growth, The Women’s Corner is expanding by adding four more labor/delivery/recovery suites for a total of 10 suites. The unit also has a nursery and 13 postpartum rooms. Ames says he frequently receives feedback from patients who speak very highly of their birthing experience at The Women’s Corner. “We are dedicated to the health and well-being of mothers and babies, and a great patient experience is all part of that,” he says. Also contributing to the high quality ratings is the robotic surgery program at Edinburg Regional Medical Center. “Minimally invasive women’s surgery is becoming the standard of care. We’ve added advanced technology and training for the physicians to continue to be on the cutting edge of patient care,” says Ames. The Women’s Corner offers many benefits for mothers and babies. Childbirth classes are offered in English and Spanish. 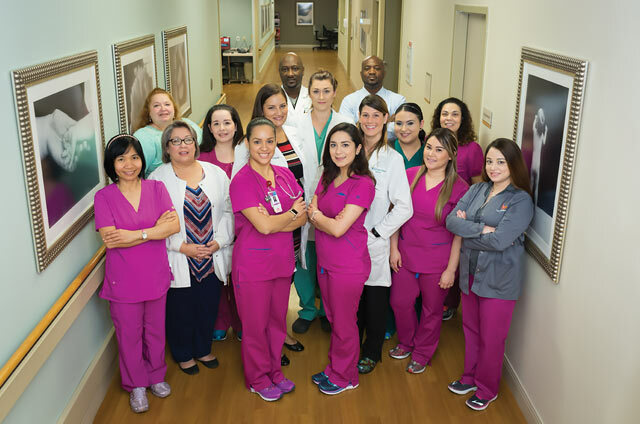 The medical staff includes physicians, trained labor and delivery nurses, midwives, as well as full-time International Board Certified Lactation Consultants (IBCLC). In addition, both Edinburg Regional Medical Center and McAllen Medical Center have received designation from the Texas Department of State Health Services as “Texas Ten Step” programs, which encourages breastfeeding as the preferred method of feeding for newborns and infants. “Our hospitals support breastfeeding mothers and help with resources once mothers are discharged. In addition, we are Texas Mother-Friendly Worksites. This means we are registered to provide employees or visitors to our hospitals with a comfortable breastfeeding/pumping room at any time,” Ames says. Giannina Guardia-Rullan, MD, is part of the obstetrics and gynecological team at Valley Care Clinics. She earned her Doctorate in Medicine from the Ponce School of Medicine, then completed her residency in obstetrics and gynecology at the University of Puerto Rico – Medical Sciences Campus. She will start performing robotic gynecology procedures in 2018 with the da Vinci® robot. Dr. Guardia-Rullan holds memberships with the American Association of Gynecologic Laparoscopists (AAGL); Society of Laparoendoscopic Surgeons (SLS); American Congress of Obstetricians and Gynecologists (ACOG); American Medical Association (AMA); and American College of Physicians (ACP). She speaks English, Spanish and French.